Just past Caribou Creek as you are heading east, use the small pull out on your left and look up towards the cliffs. 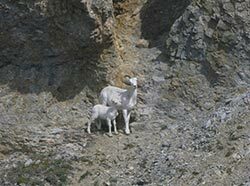 Dall sheep, both ewes and lambs, are often visible, often low enough on the mountain to be seen without binoculars. The best months for viewing are late May (when new lambs can be seen) through mid-September. 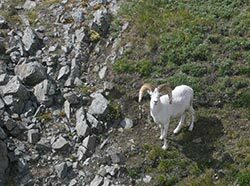 Groups of sheep high up on Sheep Mountain are often visible from here. As you continue east, a couple additional pullouts may also afford views of sheep along the flanks of Sheep Mountain. Use your binoculars. 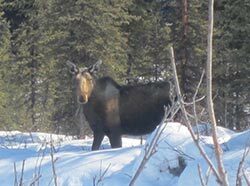 At the end of Sheep Mountain, a dirt road leading south into the valley can sometimes provide opportunities to view moose and beaver. Beginning in August, the occasional grizzly bear may be spotted grazing on blueberries in the area. On the north side of the highway is a marked trailhead, part of the Chickaloon-Knik-Nelchina Trail system. The trailhead also includes spotting scopes. A rare hadrosaur or duck billed dinosaur was discovered near this site, one of oldest known in the world. You’ll find access to five different trails from this trailhead. 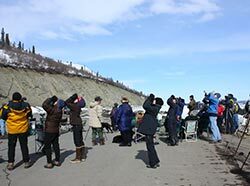 A large double-ended turnout is the site of the annual Gunsight Mountain Hawk Watch each April. 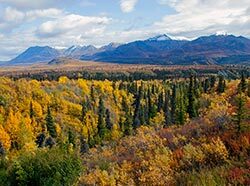 The National Audubon Society recognizes this “squeeze point” in the Chugach Mountains as a major migratory path for hawks, eagles and other raptors. The area also marks the beginning of a transition from the Cook Inlet basin to the Copper River basin. Raptor enthusiasts scan the skies over Gunsight Mt.